Bianca is beautiful in design and what she produces! Introducing the PL162T Bianca from Lelit, their newest, double boiler machine. With the Bianca, Lelit continues to outdo themselves and now lead the industry with the widest range of prosumer models. It packs some of the best technology that will make any barista jump for joy. 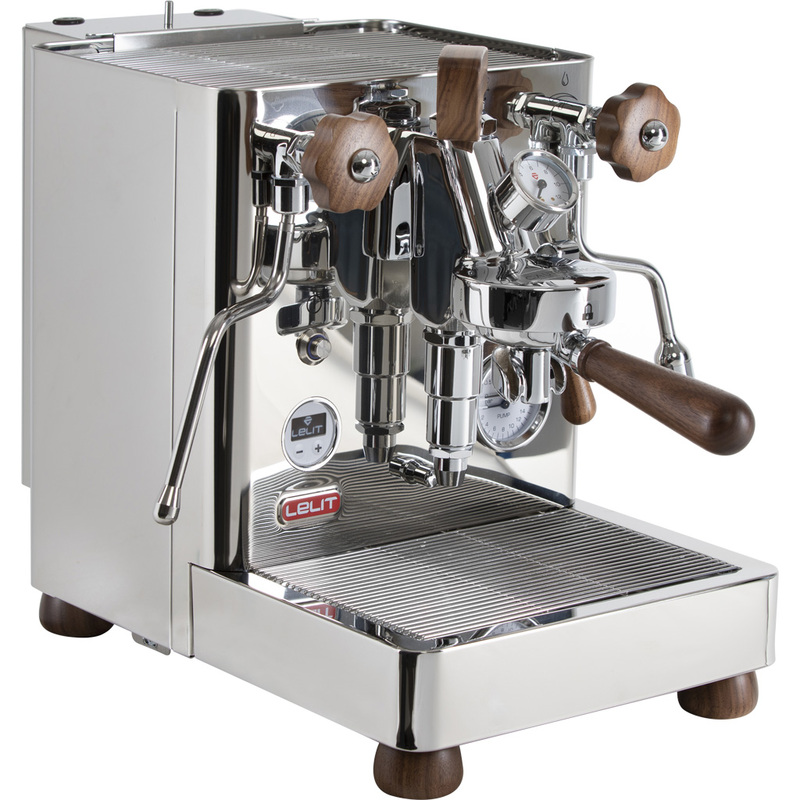 Not only does the machine include a PID double boiler, for those who are looking to experiment with pressure profiling seeking the Holy Grail; but, sitting on top of the legendary E61 grouphead is a wooden paddle that allows the user to manually adjust the brew pressure as the espresso shot is extracting! No need to pre-program it with fingers-crossed that your flavor profile will be to your liking. You have the control, right at your fingertips with a brew pressure readout at the group! The Bianca has a water reservoir that can be re-positioned on either side of the machine to suit your needs and your counter-top. Don’t want a tank? No worries! The Bianca can be directly plumbed in too (even the drip tray can be drained!) All of these features are encased in a stainless steel body, accented by wooden handles, feet, and lever. Control Brew Pressure on the Fly! The wooden paddle and brew pressure gauge mounted on top of the grouphead allows full manual control over the brew pressure as you are pulling your shot of espresso. Play with flavor profiles to your hearts content! Have you ever seen an espresso machine that gives you a choice where to put the water reservoir? The Bianca does! Even better, it also has the option to be directly plumbed in, including the drip tray. 3-cup bottomless portafilter with smooth wodden handle included with the machine. On the outside, the Bianca shines with stainless steel body polished to a mirror finish (subject to change on final version). And in the inside, it has two insulated stainless steel boilers with copper tubing connecting the boilers to the grouphead or valves. Less plastic is always a bonus in our eyes. In addition to the portafilter handle being crafted out of wood, the Bianca also has wooden accents on steam / hot water knobs, lever, wooden paddle, and feet! Lelit adds their sophisticated PID system, that allows timed preinfusion, a reference timer, and a low-water level alert. A dual-pressure gauge on the other side of the machine measures both the boiler pressure (0-4 bar) on top and pump pressure (0-16 bar) on the bottom. Allows for more flexibility. Rosette-style knobs control the separate steam and hot water wands, which are multi directional. The steam wand comes with a 2 hole steam tip. With the lever on the side of the grouphead brought to the down position, the brew pressure is relieved in the portafilter so it can be quickly removed and refilled. The result is a usually a dry puck of coffee to be knocked out. If not, there may be too much space (too little coffee) in the basket, or an inconsistent/too fine a coffee grind. The OPV is set by Lelit to open at 12 bar of brew pressure. Although adjustable, it is strongly recommended not to adjust the OPV because the paddle on the grouphead is adjusts the pressure at the grouphead. In addition, it is set at 12 bar so as to not allow the water if the coffee boiler to exit and cause potential damage to the heating element from a lack of water. If the maximum brew pressure needs to be lowered, it is best to adjust the adjustment screw on the rotary vane pump.